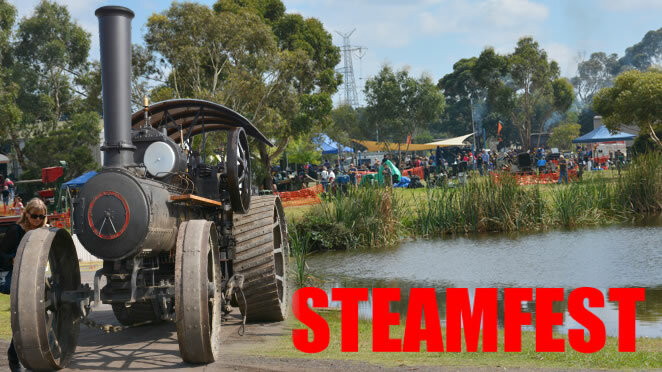 Vintage machinery fires up over the Steamfest weekend! This is an event with great cross generational appeal - lots of fun for the kids and fascination for machinery lovers of all ages. The flywheels will be spinning in the industrial steam and diesel sections of the club museum. The entire engine room of a steam tug will be on display with several of its steam engines operating. Traction engines tractors and steam rollers will be parading around the grounds. Earth moving machinery will be digging shovelling and moving great piles of earth. Up in the rear paddock the heavy horses will be demonstrating how it was all done when horse power was provided by horses. For the kids young and old a ride on the miniature railway is not to be missed and Thomas fans just love operating the buttons to control the engines on the model railway. in the refreshment area local bands will be performing throughout the day. Blacksmiths model engineers and wood workers will demonstrate their skills. A tank and other military vehicles will in action along with boats on the lake. Hay baling timber sawing rock crushing elegant vintage cars tractors trucks and plenty more will keep young and old enthralled for hours.